Your night mouth guard is intended to fit over the teeth while you sleep in order to protect them from damage, usually from teeth grinding (bruxism). If your night guard keeps falling out while you’re sleeping, this indicates that the fit may not be quite right. If you’ve bought your night guard over-the-counter from a drugstore, it may benefit you to come into our office and have a custom night guard made for you. 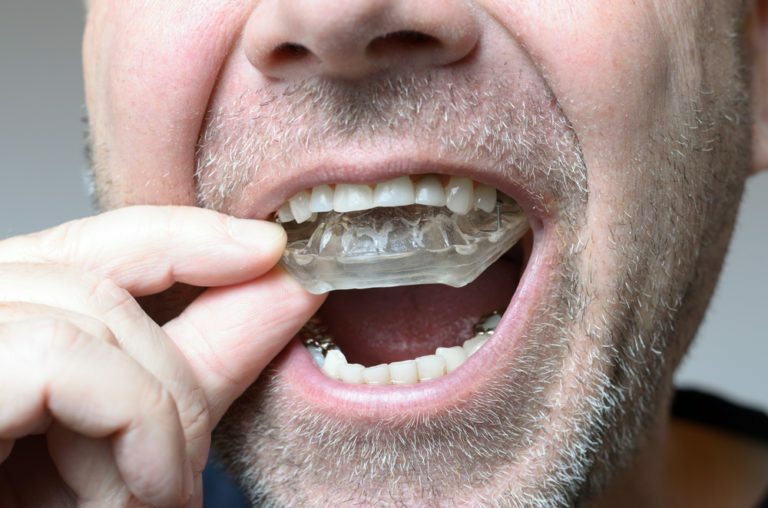 A custom-fitted night guard will be created specifically for your teeth and bite, ensuring that it will stay in place while you sleep no matter how hard you clench your teeth. Your night mouth guard should stay firmly in place while you are sleeping, and fit both comfortably and snugly. It should allow you to keep your mouth closed and breathe normally, without shifting. In addition to these traits, your night guard should be odorless, tasteless, and should be durable. It should also be easy for you to clean. Who should wear a night mouth guard? In most cases, you will be asked to wear a night guard if you suffer from nighttime teeth grinding. This allows your teeth to be protected from the unusual clenching force of your jaw that occurs while you are unaware. It also helps to prevent you from developing TMJ/TMD. In some patients, wearing a nighttime mouth guard over the teeth can help to relieve discomfort from chronic tension headaches, facial/jaw pain, and tooth soreness. It is important not to settle for a simple athletic guard in place of a night guard, as these are not designed for the same purpose. An athletic guard may shift while you’re sleeping; a night guard will not. In fact, some night guards will encourage you to keep your jaw relaxed while you sleep; these are referred to as anterior deprogrammers or NTI devices. Athletic guards cannot perform this function, and should not be substituted for your night guard.